Cardiff Fire forward Tamas Elias. Pic: James Assinder. 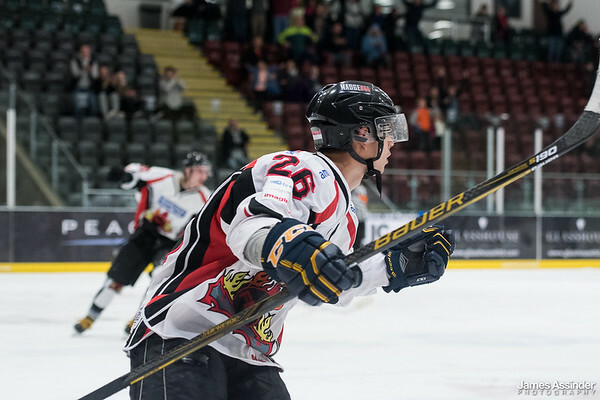 Cardiff Fire are preparing for two big home fixtures in their quest to climb the National Ice Hockey League table. Head coach Mark Smith and his Fire players entertain high-flying Solent Devils at the Viola Arena in Cardiff Bay on Sunday (February 24, 6pm) and then take on Peterborough Phantoms at the same venue on the following Saturday (6.30pm). Both are tough fixtures with Solent still in the South Two title chase, while Peterborough are two points ahead of Fire having played three games more. Cardiff slipped up 5-3 in their latest NIHL match, in the Severnside derby against Bristol Pitbulls, despite outshooting their visitors 43-27. Six goals were scored in seven minutes early in the second period. The first four of those went to visitors Bulldogs, all coming in a four minute spell, before Fire hit back with two of their own. Fire were also awarded a penalty shot, but Jordan Powell’s effort was beaten away by goaltender Ross Miller. Powell did score, though, with Tamas Elias and Jackson Price netting Fire’s other goals. Bulldogs brought a team with strong Cardiff and Devils links including Welsh-born brothers Giacomo and Giovanni Rafaelli plus goaltender Ross Miller. Jackson Price. Pic: James Assinder. Scorers, Fire: Jordan Powell 1+1, Tamas Elias 1+1, Jackson Price 1+0. Bulldogs: Jamie Newton 1+1, Giacomo Rafaelli 1+0, Olly Shone 2+0, Nathan Chilcott 1+0, Richard Hargreaves 0+3, Steven Osman 0+2, Giovanni Rafaelli 0+1. Period scores (Fire first): 1-0; 2-4 (3-5); 0-0 (3-5). Shots on goal: Fire (on Ross Miller) 8+20+15=43, Bulldogs (on James Whiting) 8+11+8=27. Penalties in minutes: Fire 20+0+2=22, Bulldogs 27+4+2=33. Saturday, February 23: Bristol Pitbulls v Haringey Huskies (5pm), Romford Raiders v Oxford City Stars (5.15pm), Invicta v Slough Jets (5.15pm), Guildford v Peterborough Phantoms (5.30pm), Basingstoke Buffalo v Chelmsford Chieftains (6.15pm). Sunday, February 24: Cardiff Fire v Solent Devils (6pm), Peterborough Phantoms v Lee Valley Lions (5.30pm), Chelmsford Chieftains v Bracknell Hornets (5.30pm), Oxford City Stars v Invicta (6.15pm), Swindon Wildcats v Basingstoke Buffalo (6.15pm). Saturday, March 2: Guildford v Swindon Wildcats (5.30pm), Haringey Huskies v Solent Devils (5.30pm), Bracknell Hornets v Lee Valley Lions (6pm), Cardiff Fire v Peterborough Phantoms (6.30pm). Sunday, March 3: Invicta v Basingstoke Buffalo (5.15pm), Romford Raiders v Swindon Wildcats (5.30pm).